Tropical rainforest tree canopies offer an environment with unique rewards but also challenges for the many inhabitants, amongst which are wingless insects and other non-flying arthropods. Whilst they benefit from the abundant flowers and fruits found at the treetops, wingless arthropods are in danger from predatory birds, reptiles, spiders and ants, that actively hunt or dislodge them, with the prospect of a long drop to either the understory or ground. In this context it may not be such a surprise to find that several tree-dwelling (‘arboreal’) arthropod groups have independently arrived at ways of generating a controlled glide when falling from a tree. So far a number of ants, bristletails and one spider species have been discovered to be capable of ‘directed aerial descent’, using gliding maneouvers to escape from predators and successfully survive what would otherwise be a perilous fall. Among insects, arguably the most remarkable instance of convergent adaptation to gliding is found in a diversity of specialised ants that inhabit tropical forests. Tree-dwelling (‘arboreal’) ants display controlled gliding when dislodged from a tree trunk or threatened by predation. Gliding species include members of three separate families: Myrmicinae (e.g. Cephalotus atratus, Daceton armigerum, Procryptocerus convergens), Pseudomyrmecinae (e.g. Pseudomyrmex elongatus) and Formicinae (a single species,Camponotus canescens). 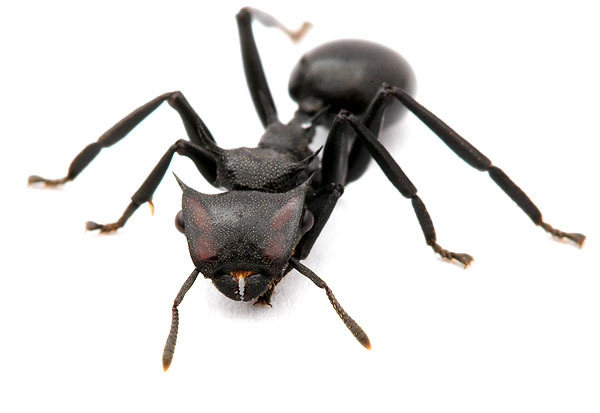 All of these ants possess lateral flaps, or flanges, on their bodies. Myrmicinae and Pseudomyrmicini ants, which glide abdomen first, even have a moveable post-petiole region, so enabling accurate steering during aerial descent. They are further adapted to gliding by having a dorso-ventrally flattened body that confers an improved lift: drag ratio combined with good vision for locating landing sites as they approach a tree trunk. This suite of morphological adaptations illustrates convergence on a shared solution due to selection pressure for gliding ability. Gliding form and behaviour has not only arisen in three distinct ant families but even in sub-sets of species within certain genera (e.g. there are both gliding and non-gliding species of Daceton, Pseudomyrmex andCamponotus). Bristletails (archaegnathans) are a group of primitive, wingless insects. Stephen Yanoviak and colleagues discovered that arboreal bristletails have the capability of a controlled descent when falling from canopy tree trunks, thus enabling them to avoid dangerous encounters on the forest floor. Gliding performance was tested in various species that inhabit tree trunk or understory environments such as low-growing plants or leaf litter. Impressively tree-dwellers (e.g. Meinertellus, Janetschekilis) were able to right themselves during a fall and generate a steep glide to safety, with their steering assisted by flexing of the abdomen and deployment of caudal ‘tail’ filaments. By contrast, when dropped from high up in the forest canopy, understory-dwelling bristletails failed to glide. With their long legs and often comparatively large size, spiders and their arachnid relatives such as scorpions, would seem unlikely contenders for gliding arthropods. Indeed, numerous species from five arachnid groups (spiders, opilionids, pseudo-scorpions, amblypygids and scorpions) have been tested for aerial performance, and of these only one spider demonstrates directed aerial descent behavior. The exceptional spider in question is Selenops, a large arboreal hunter spider that inhabits lowland rainforests in the Americas. 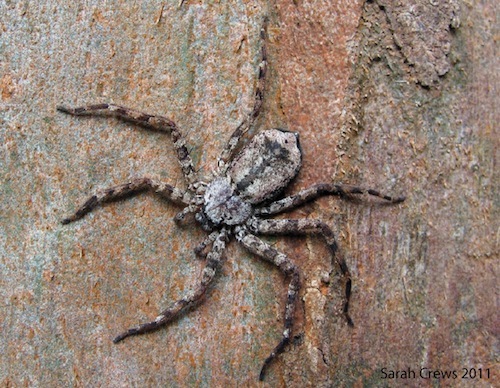 During a fall from a tree high in the canopy Selenops spiders can efficiently right themselves, adopt their typical dorso-ventrally flattened shape and then make a controlled descent back to their original tree trunk. They seem to steer their bodies using movements of antero-laterally directed forelegs. Like gliding ants they also appear to use their large eyes to gather visual cues for their glide trajectory. Other arboreal spiders were tested and while several were capable of righting themselves in the air, only Selenops species demonstrated controlled descent. Gliding ants, bristletails and spiders each depend on different body morphologies and means of aerial manoeuvring and yet they all achieve similarly high rates of success (around 90%) when gliding back to the safety of their tree trunks. This advantageous skill in the air is a striking case of convergence, dissimilar arthropods finding distinct ways to effect gliding behaviour. It may also be that given that the first insects were wingless, a capacity to glide may have been one avenue to powered flight. This entry was posted in Convergence, Research and tagged ants, arthropods, bristletails, gliding, spiders. Bookmark the permalink.